Product categories of Three-beam Spunbond Nonwoven Line Series, we are specialized manufacturers from China, Non Woven Polypropylene Fabric, Three-Beam Spunbond Nonwoven Line suppliers/factory, wholesale high-quality products of Beam Spunbond Nonwoven Fabric Line R & D and manufacturing, we have the perfect after-sales service and technical support. Look forward to your cooperation! 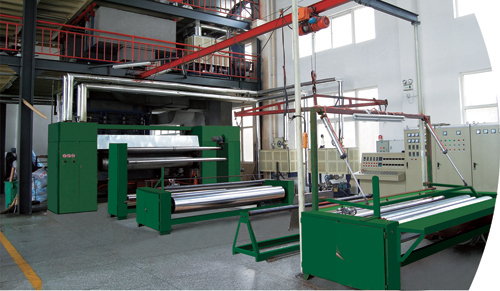 Three-beam spunbond nonwoven machines distribute polypropylene (PP) by three dies, which greatly promotes the output of Nonwoven Fabric. The product of SSS nonwoven machine is more suitable for baby diapers, older diapers, sanitary napkins and so on. Based on the advantages of SS nonwoven machine, SSS nonwoven machine has higher ability of distribution of PP, greater output of nonwoven fabric, higher intensity of nonwoven fabric cover, better permeability of nonwoven fabric.